What a day to go sledding! With the forecast calling for a bunch of snow in Boulder this is a great opportunity to get the kids out and enjoy some time together! 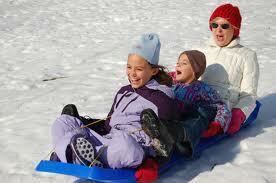 Even young kids can enjoy sledding! 1. Always have kids wear helmets! 2. Dress them warmly with lots of layers. Bring hand warmers if possible to pop in their gloves to keep their hands really toasty. 3. Bring warm drinks: Hot cocoa or cider goes a long way to keeping kids warm and comfortable. Scott Carpenter Park: This is a mellow, fun slope for the kids, but adults enjoy it too! Tantra Park [Just South of 46th and Hanover]: This sledding hill can get incredibly packed and at places it is steep. Foothills Community Park: There are some great, low angle slopes here for kids and adults. This entry was posted in Uncategorized and tagged Activities, Boulder, Boulder Parks and Recreation, Colorado, Families, Free, Fun, Kids, Outdoors, Parks, Sledding, Snow, Winter by Boulder Families. Bookmark the permalink.